Have you ever made oobleck before? Oobleck is cornstarch and water that when mixed together can act like a solid and a liquid. 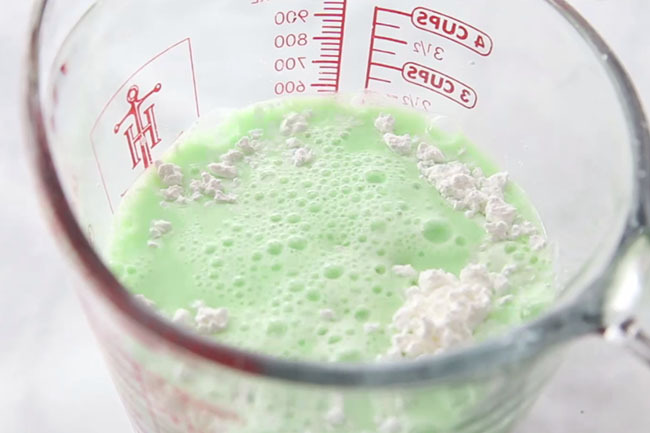 We’ll show you how to make oobleck. 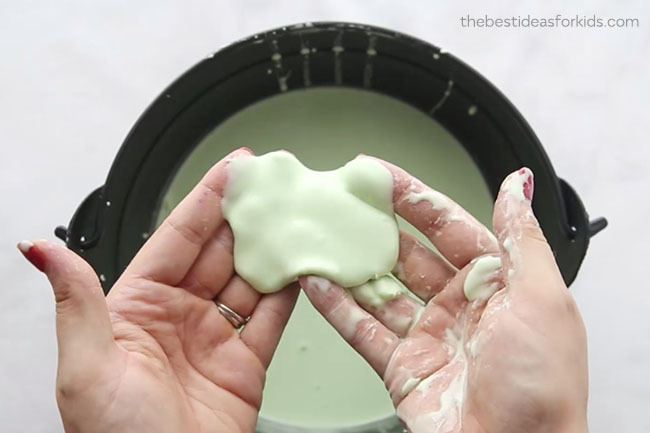 This oobleck recipe is simple and fun to do. 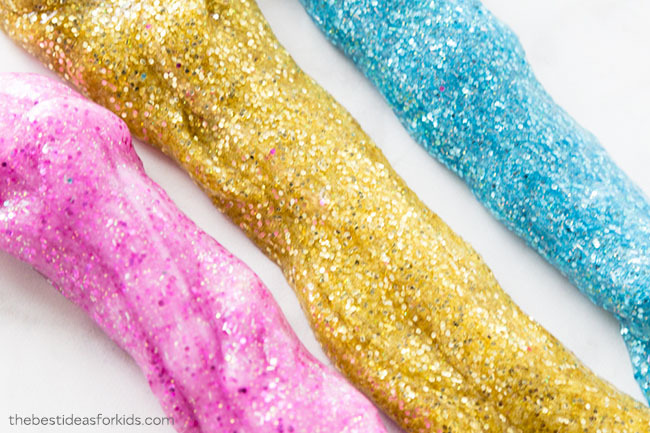 It’s a lot easier than making slime and kids love playing with it! Oobleck is a mixture of cornstarch and water. Two ingredients you likely already have in your kitchen cupboards! 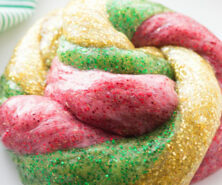 You can also add some food coloring to it. We made ours green to turn it into a pretend Witch’s brew for Halloween. You can leave it without color or make any color you like. 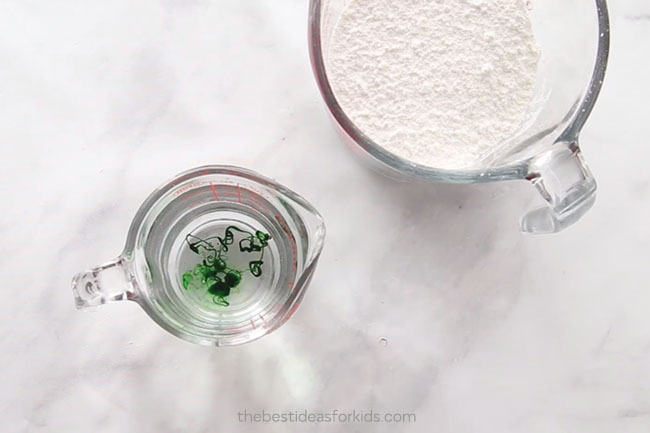 This simple oobleck recipe is easy to do and kids will love touching and playing with it! If your kids love to play with slime then they will also love oobleck. 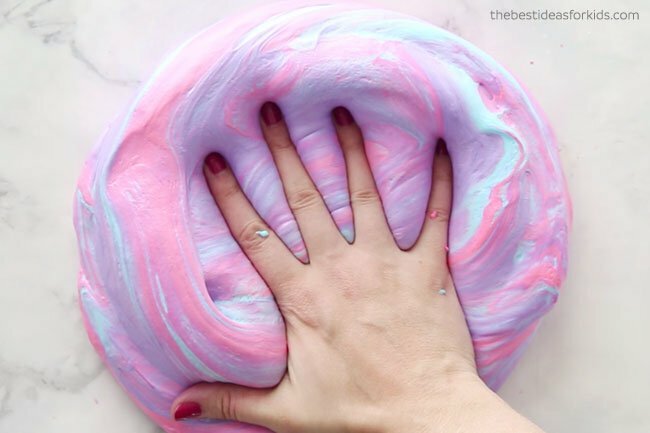 If you want to make slime too, you can find all of our slime recipes here. Oobleck isn’t a liquid or a solid, it’s a non-Newtonian fluid. At times, it may seem like a solid or a liquid but it acts differently than a normal solid or liquid. Making oobleck is a great science experiment to show how changes in pressure can change the properties of some materials. Sort of like how temperature changes the properties of water. Cold or freezing temperatures turns water into ice. Whereas warm temperatures melts ice and turns it into a liquid. 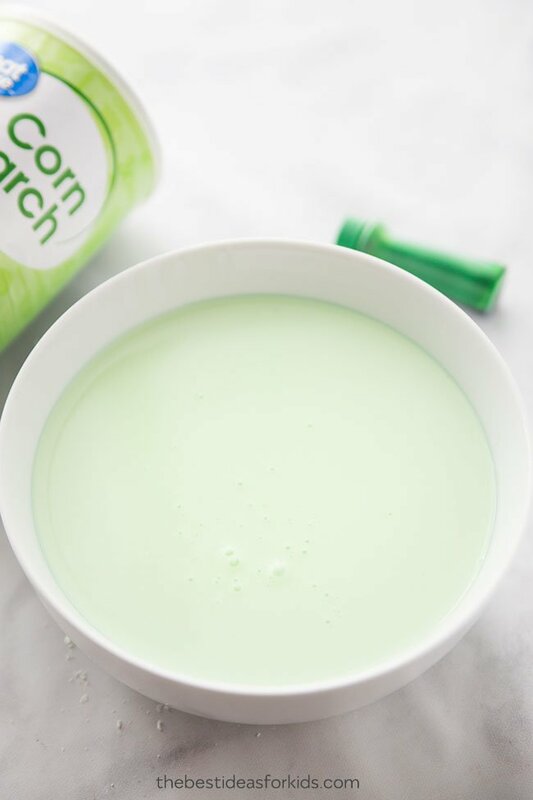 Here’s how to see the difference you can make by applying pressure to your oobleck: Apply quick pressure with a spoon and this will increase the oobleck’s viscosity by forcing the cornstarch particles together. It will feel hard and you can even form the oobleck into a ball if you try with your hands. Release your pressure or slowly dip your spoon into the mixture and it will act like it’s more like water. By moving slowly, the cornstarch particles have time to move out of the way. 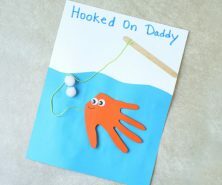 If you want to pair this activity with a book, you can read the Dr Seuss book, Bartholomew and the Oobleck. 1. Mix 2 cups of cornstarch to 1 cup of water into a bowl. Mix the cornstarch and water until your oobleck is formed. Tip: If you would like to color your oobleck, add your food coloring to your water and then mix with the cornstarch. Halloween Activity Suggestion: If you want to turn this into a Witch’s brew oobleck, repeat this recipe until your cauldron is full. This 14 inch cauldron is perfect for this activity. 2. 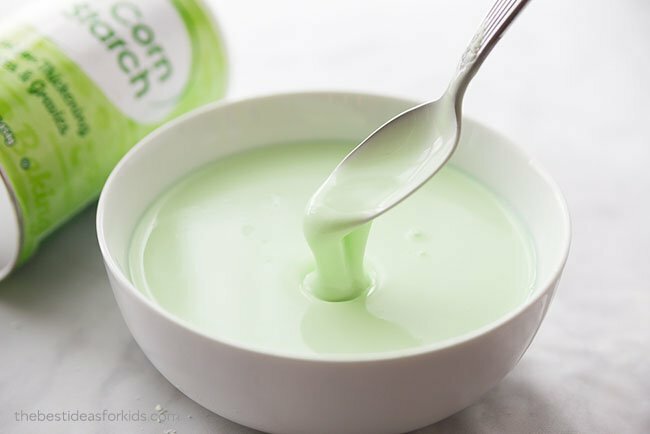 If you find the mixture is a little too watery and not forming into a solid when you pull the oobleck out of your bowl then add more cornstarch. If you find the mixture is not dripping like a liquid, add a little more water. Just keep experimenting until you get the consistency of oobleck. 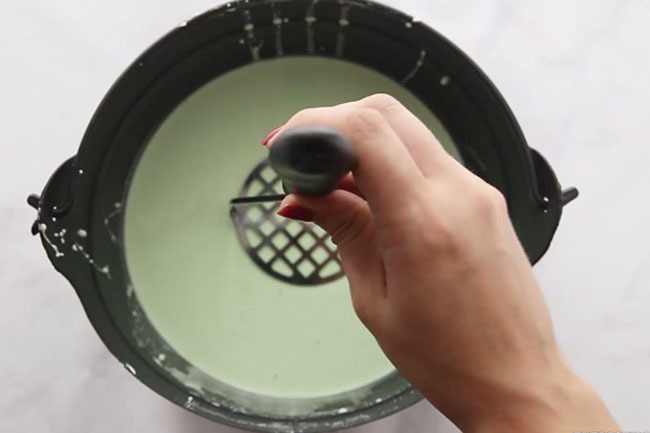 Take a potato masher or spoon and hit the top of the oobleck quickly. You’ll notice the spoon or utensil will bounce off, giving the appearance that the oobleck is a solid. As mentioned above, this is because the pressure forces the cornstarch particles together increasing the oobleck’s viscosity. Then move slowly into the oobleck with your spoon and this will allow the particles time to move out of the way which will let you dip it into the oobleck. Pick up the oobleck with your hands and form a ball. Then let go of the ball and watch it melt into your hands like magic! 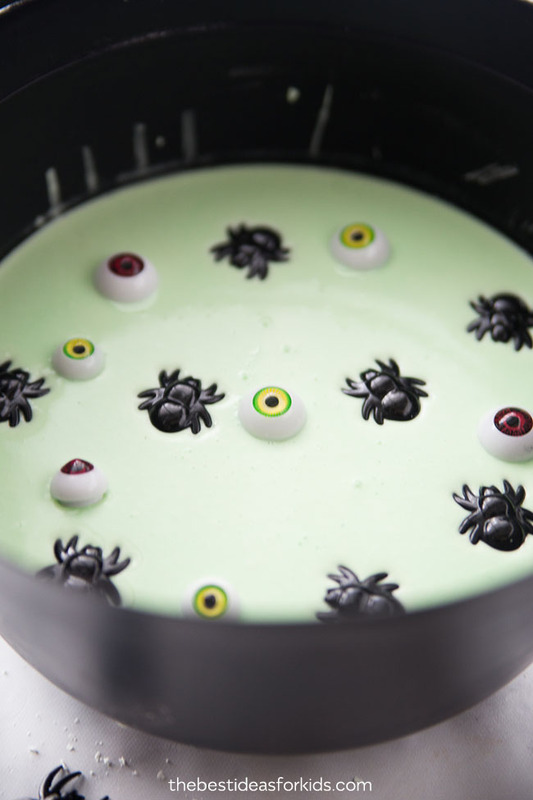 Make Halloween oobleck! 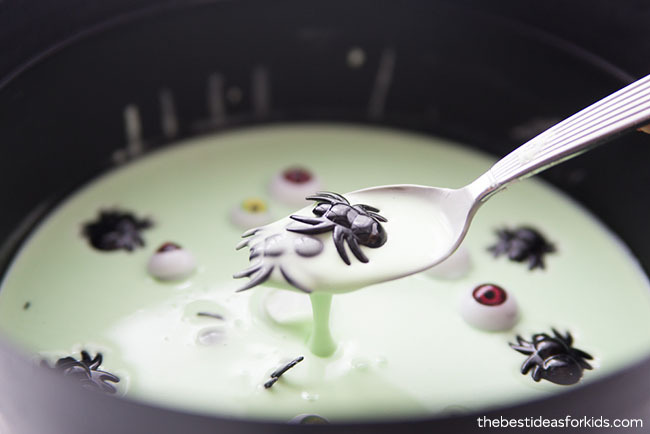 Add some small spiders and eyes and about 10 batches of oobleck (will vary depending on your size) into a cauldron. Make it green or purple to look like a Witch’s brew! Kids will love dipping their hands into the witch’s brew to find Halloween treasure while they learn about the science behind oobleck! 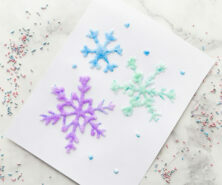 We know you’ll love making this easy science experiment with your kids! This is perfect for a Halloween party or even just a rainy day activity. Be sure to see all of our slime recipes you can make to explore the science behind slime as well! For more fun science for kids – we have lots of slime recipes. Learn how to make slime with contact solution. Fluffy slime is really fun to make! It has a different texture than regular slime and is really fun to play with. Does cornflour work the same? Can you use flour instead of cornstarch? No it needs to be cornstarch to work. I can’t wait to try this with my kiddos! Quick question, water temperature wasn’t mentioned… Should water be cold or warm? What a fun idea. My kids are going to lose their little minds when they get to make this and then share it with their friends.